My husband and I are getting ready for a short trip up to Colorado Springs to visit my mother and brother. I’m looking forward to it. We won’t be staying very long, but at least I will be able to see how things are going for her, now that she is on her own. After Colorado Springs, we are heading up to Yellowstone Park. I have never been there. My husband has been there once, years ago. It is one of the places we have wanted to go for a while. We always had hoped to take our son and daughter with us, but once they got into high school, we found out that ship had sailed. We had never relished the idea of going while school was in session, so it was one of those plans that was never realized. I do hope you and your hubby have a good, safe trip. Enjoy each other as you travel to see your mother. Thanks, Linda. I think we will. We called our son, and all is quiet on the home front. As for us, I’m glad we packed our jackets for Yellowstone, because a cold front is definitely moving through Texas! Danna, this being the last day of summer, we have just had a rather noisy thunderstorm go through our area of Ohio. Most of the area’s highschool football games were canceled tonight, to be played sometime tomorrow. It was rather chilly and very windy today. I started to read “Bedeviled Eggs” by Laura Childs today. I am also reading “Bookplate Special” by Lorna Barrett. I read one chapter of each book, get up and do some kind of cleaning around the house, then I go back to reading. Sure makes for a less boring day. These seem to be very good books for me to read on the first weekend of Fall. I shouldn’t say that I have “boring ” days. As long as I have something to read, I am never bored. Well, Linda, at least you are getting some household chores done in good mystery book company!. Have a great time, Danna! Ohmygosh, you are going to love Yellowstone. It is so awesome. It’s like stepping into a fantasy book. I know you don’t read fantasy, but you’ll see all those possibilities when you’re standing there watch the earth create. Maria, if you had put this comment in anonymously, I think I would have been able to identify you! 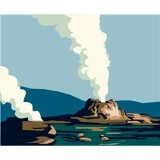 Your dragons bellowing fire, and gnomes painting has me waiting eagerly to experience Yellowstone for the first time. Marion, my husband retired a little earlier than we had planned, so we are hoping to take advantage of off seasons. When friends of mine commiserate about our hot summers, I tell them it’s not so bad >>> since almost everywhere (if not everywhere!) you go has central air conditioning down here. D. C. without air conditioning would be a problem! It was awful. I hope you don’t mean that your husband is in poor health. I wouldn’t think so with all that lovely traveling but I hope not. The off season is so often desireable in so many ways. I would love to see the cherry blossoms in DC but they can have their summers. Hope you all are having a lovely time. Marion, we lived in the D.C. area years ago, but the summers there don’t seem worse than our summers here… both hot and humid. lol. I guess it is hard to distinguish between degrees of H***. I think what I meant is that I have no desire to experience any more of their summers when I have every bit as bad here at home. Escept, Marion, in DC you have access to all sorts of great places to visit on the east coast… even if it is hot. Taking two days to drive out of Texas is a reminder of earlier times in my life when I had access to all sorts of places, within just a few hours drive. Too true, Danna. I remember when I worked at SAS shoe store. A customer in New Hampshire called wanting to know how to get to the nearest SAS store. I told her it was in Vermont and she was delighted. I thought that was strange (since it was in a different state) until she pointed how close that was to her. I was happy for her but I had certainly lost track of how small some states are compared to Texas. I still remember when my family went to Big Bend and Fort Davis from San Marcos in 1982. Big Bend and Fort Davis were sensational but, boy, talk about driving through about 3 to 4 hundred miles of NOTHING to get there. No Kindles, no lap tops, no nothing. BOY, what a boring drive! Marion, whenever my husband and I consider a trip that will require driving, we get sort of discouraged by the fact that it will take two days (each way!) just to leave/return to Texas. And, as you said, some of the driving is pretty monotonous. Danna Have a safe and wonderful trip. I love visiting CO as it is such a beautiful state. I have never been to Yellowstone. It was always on our “to do” list. We just came back from a mini-vacation to Newport RI. It was lots of fun to watch the ocean and all the boats. There was even a cruise ship in port with plenty of tourists. I did some reading of books on my Nook. It is so convenient when I take a trip. Re reading Ruth Dudley Edwards and continuing with Lesley Cookman among many others. Regina, I, too, love Colorado. I lived there for several years before finally moving to Texas. The two states couldn’t be more different! Both my husband and I have our Kindles with us. I am so happy with these gizmos! There is nothing like taking an entire library of books with you on a trip! Enjoy your trip. Hope all is going well with your mother and brother. I remember earlier this year when you made the Colorado trip with Miss Silver and Brother Cadfael (audio books) as your travel companions. I could just visualize them traveling down the road with you. Yellowstone is magnificent. I remember being surprised by the size of it. It took awhile to go from place to place. Should be a good time to go as the peak vacation time is over. Enjoy yourself! It’s funny that you mentioned Miss Silver and Brother Cadfael from my earlier trip to Colorado. This time, Brother Cadfael isn’t “riding shotgun”>>> but Derek Jacoby is the narrator of this particular book on tape. So, since every time I think of Brother Cadfael, I see him in my mind as Sir Jacoby… he is sort of with us. I hope you enjoy your trip and Yellowstone is wonderful and amazing….but, please be aware that there are alot of local fires this summer in Wyoming and Montana and that there will probably be some very smoky and hazy days where the visability is poor. This is definitely not the usual situation where the air is usually crisp and clear and visibility unlimited. Maybe there will be some rain to help clear the air before you arrive. Good point, Pat. We’ll check online before making our way up there from Colorado Springs. Marion if you could get or ask as a gift, get a kindle you can adjust the type on there to suit your needs. I have one and really enjoy the size of the print. I know what you mean about some novels being in tiny print. Marion, Alfred is so right about the Kindle’s font size. I love being able to adjust the print to as big as I feel comfortable with. I just don’t enjoy reading books with tiny font anymore. I saw that Amazon has one for just $69. I really don’t care about bells and whistles and all the ‘hot’ extras so I will check Better Business publications for what is really essential and then think some more. Maybe it can be a birthday present to myself. I was born in November on the same day and year as John John Kennedy. Poor man, at least I’m here to tell the tale. Marion, my daughter’s Kindle is the one with no bells nor whistles, and she loves it. Have a safe and fun trip! We’ll all be hanging around the cozy mystery site, waiting for your return….don’t worry about us, there is plenty to read here! I’m enjoying browsing through some old posts from the beginning of the blog, things I haven’t seen before. Donna, I love going back through and reading some of the older post. Some of those older topics still apply today. Thanks for the suggestion, Alfred. I was just thinking about that today after I wrote my entry. It may be time for that. I was wondering if I could adjust the print size. Thanks for telling me. Take care. Welcome to the site, Shirley F! I’m glad you found us. I visited Niagara Falls in Ontario, and was totally entranced by your beautiful country. Your trip from Niagara Falls to San Francisco, back through Colorado and across Canada sounds like a trip of a lifetime. I hope you have a wonderful trip and that you find your mother and brother well. Yellowstone is amazing and you will love it. Say hello to Old Faithful from me! Carrie, my brother is doing really, really well. My mother is doing pretty well, although I wish she would stop trying to be as independent as she want to be. As much as I am enjoying my time with my family, I am looking forward to seeing Yellowstone. As for saying hello to Old Faithful, consider it done! @Danna – You are so fortunate to get to go to Yellowstone at this time of year! I’m sure you will love the scenery and wildlife. Many years ago, we went and at one point had to wait for a herd of buffalo to mosey across the road. They sure took their time! Especially a big bull. I was amazed at how daring some foolish tourists were getting *real* close to a huge elk. We went in October and it started snowing before we exited the park. The whole area was soooo beautiful and I especially loved the pretty hot pots. Oh and BTW, Tey’s Alan Grant series is next on my TBR DTB list, too. Have a wonderful trip! @marion – Third the suggestions for a Kindle. I have a DX because eventually I’ll need the font even larger and since it has a bigger screen, won’t have to page down as often. However, the smallest version ($69) is really tempting now that the price has decreased (I think $10) and it’s lighter and faster than my version. The new PaperWhite looks good, too, for folks who read in bed and don’t want to disturb their mate with a light on. You may want to compare the different versions in a store and then order the one you like best from Amazon since thir customer service is supposedly more helpful if something goes wrong and you bought direct. If you can wait until after Thanksgiving, you may snag a really good deal. BB, I was hoping that mid September wouldn’t be too late to view a lot of the wildlife in Yellowstone, so your comment about going in October and seeing a lot of the animals has me really excited! I’m sure you will see plenty of buffalo and elk. We also saw a wolf, coyote, or fox (can’t remember which now) and would probably have seen more wildlife if we could have stayed longer than one day. The one thing my father wanted to see most, though, we didn’t, which was a moose. BTW, at the time we went, and maybe now, too, the town of Gardiner, MT, at the north gate had free-roaming elk. For us tourists, it was cool, but I bet they were/are a headache for the locals! Thanks for the Gardiner tip, BB. I’m not sure if we are going to go the north gate, but if we do, we’ll definitely try to get there. I absolutely loved Judy Moore’s latest book, Somebody Killed the Cart Girl. The story is well-structured and well-paced so as to allow the reader time to attempt to solve the mystery before the evil-doer is revealed. The dialogue is memorable as are the characters. At times, I was comparing Abby to Brenda of “The Closer”. Perhaps Ms. Moore should submit this book as a screenplay. Since Sue Grafton has refused to allow any of her crime novels to be filmed, there exists an opportunity……. Thank you, BonnieJ, for telling us about Judy Moore! Yes, it is a drag. Being single, I also have to consider “Well, if I take myself out there, I have to get myself back. I never was much of a long distance driver and now my health is not the best so I generally have to settle for being an armchair driver. I am glad I have the memories of traveling with my parents so I can say I’ve been around a little bit. I have lots of photographs to jog my memory. Austin and San Antonio traffic is wayyyyyyyyyyy beyond me but I sometimes make little trips to Seguin and New Braunfels and around.